Koos de Ronde did it again. The Dutch golden team member of Kentucky has won the FEI World Cup™ Driving competition in Mechelen for the third time in a row. De Ronde beat Hungary’s Jozsef Dobrovitz with an exciting fast and clear round to put the pressure on last-to-go and wild card driver Boyd Exell. But the World Champion from Australia was unable to stay clear and left the arena with 15 penalty points. When the scores were finally tallied, De Ronde was declared the deserved winner. After wins in 2008 and 2009 in the Nekkerhal just 140 kilometres from his home in The Netherlands, Koos de Ronde was determined to be the best again in Mechelen. Koos was very pleased to be able to use his black horse Charley in the lead of his team again after having to replace him at Budapest due to injury. De Ronde put his team in the highest gear from the start and was the only driver with two clear rounds. Boyd Exell, who had received one of the three wild cards from the organisers, was last to go in the Winning Round after a very fast first round. Koos had asked him to be generous before he went into the fully packed arena, but Boyd explained afterwards that he had not planned to be that generous! Boyd, who had swapped his leaders around, went too fast in tight places and knocked three balls down. Hungary’s Jozsef Dobrovitz knew he had already qualified for the FEI World Cup™ Driving Final in Leipzig and used the show in Mechelen to try out a new leader horse. The new bay Lipizzaner stallion Basa and the experienced bay Orlov trotter Spitfire, with which Dobrovitz has been competing all season, formed the very fast leader pair of his team in the Nekkerhal. Dobrovitz was well under way to set a very fast time, but his whip got stuck in the harness, which slowed him down for eventual third place. Switzerland’s Werner Ulrich lost his chance to qualify for the Winning Round when his horses knocked over a marathon obstacle element on his way to the last gate and the resulting five-second penalty kept him out of the top three. Ulrich is currently in fifth place in the standings and, with one more competition to go, is already certain of a ticket for the Final. Jumping Mechelen horse show, which has been part of the FEI World Cup™ Driving series since the start in 2001, celebrated its 30th anniversary this year. Mechelen is famous for being able to let the maximum number of drivers, eight, start. Both Dutch World Cup driver Theo Timmerman and home driver Gert Schrijvers received wild cards along with Boyd Exell. Timmerman’s horses became a bit too strong and De Ronde's team mate from Kentucky was unable to keep up with the high-speed level that was set in Mechelen. Timmerman came fifth, ahead of Gert Schrijvers. The multiple Belgian National Champion had composed his team of two of his outdoor KWPN-geldings, one Arabo Friesian gelding and a KWPN mare, which had been lent to him by a Dutch pairs driver. Like all other non-World Cup drivers this season, it was also tough for Gert Schrijvers to meet the high World Cup speed standard, but he did very well and finished ahead of Fredrik Persson (SWE), who came seventh, even though he was using the 13-year-old Orlov trotter Pascal in the lead of his team, which was kindly lent to him by Boyd Exell. IJsbrand Chardon would have loved to win once at Mechelen and to have a small pre-birthday party. The four times World Champion is celebrating his 50th birthday on Sunday, 2 January, but it was not meant to be. After his win on the first day, Chardon was last to go and drove his team of grey Lipizzaner horses fast and accurately through the course, which was designed by Dutch World Championship course designer Johan Jacobs. But when Chardon drove towards the bridge, his right leader horse pulled to the right and the leader horses ended up left and right of the bridge. Thankfully nobody got hurt and Chardon was able to continue his very fast round after the bridge was rebuilt, but the mistake cost him a place in the Winning Round. With just the FEI World Cup™ Driving competition in Bordeaux to come, most drivers have already completed their qualification. Boyd Exell, Koos de Ronde, Jozsef Dobrovitz, IJsbrand Chardon and Werner Ulrich have booked their places at the Final in Leipzig. Zoltan Lazar is currently in sixth position but has finished his season already and will be overtaken by Bordeaux-bound drivers Daniel Würgler, Tomas Eriksson, Fredrik Persson and Theo Timmerman, who will battle it out in Bordeaux for the sixth starting place for Leipzig. 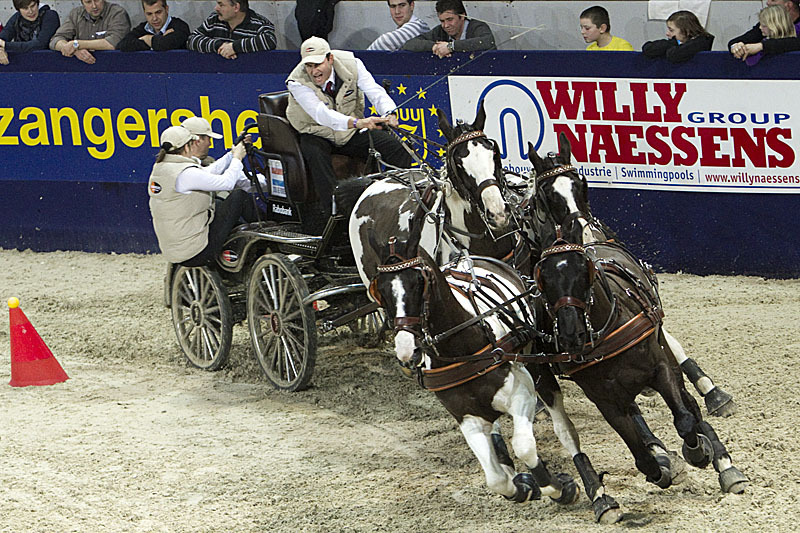 The 2010/2011 FEI World Cup™ Driving series now moves on to Bordeaux, France on Saturday, 5 February 2011.